Rushing until the last minute, Toffee, a 10 year old girl, searches for her orange dress among a disorderly pile of clothes, the one she uses for special occasions. With her dark skin, she looks radiant wearing this dress and her smile is as pure as her excitement to learn new things. She is surrounded by plastic bags, insects and the scent of oil. There is half an hour left: enough time to rinse her face with the water from a bucket, untangle her hair in front of a broken piece of mirror and adorn her wrists with colourful metallic bangles. She is almost ready, but she wears no shoes. Her mother, wraps herself in a yellow shaded sari that matches her daughter’s outfit, suddenly she realises her daughter’s shoeless feet and starts a search for flip-flops, with the support of the whole colony. Everyone radiated with excitement. It was an important day. The school awaited them for a meeting which would confirm their start in the educational program. The children were nervous and their mothers were restless as we shared with them this mixture of perplexity and enthusiasm. Holes in their clothes were hidden with safety pins and they wore over-decorated necklaces. Some of them walked barefoot in the mud. Overall, they were all excited and determined. The time came when, in the company of 15 children and their respective mothers, we had to make our way to the school we had previously selected for the new students in Sigra. Stress vanished as the pace of the meetings sped up. From now on, the classroom will be their daily companion. To start off, a daily hour of preparation before the school year begins in April. As the days pass, I notice how gradually I am losing my ability to marvel. Each day offers something unexpected; it is like an unbounded and unusual surprise. Varanasi constantly puzzles me through unexpected events that sometimes border with eccentricity. At the Sigra colony, this surprising effect let us with feelings of gratitude. We could sense that new families would want to be included in the program, but never imagined that in a matter of a day, there would not be enough desks in the classroom. After one day of incorporation of new students to the new school, the number of interested children more than doubled, jumping from a class of 15 to nearly 50 students. An unexpected yet welcomed increase. As we walk through Sigra, we have become the centre of attention, we are followed by whispers, curiosity, questions... as we stroll along the colonies, people approach us: they also want their children to go to school. There is not enough time for us to interview all the families, we can feel their impatience. These days bring us a lot of work; they are filled with momentum, yet controlled by chaos. There is no way we can stop. From the first temple bells that resound in the early morning to the howling of the street dogs at night, now more than ever, we must work to plant seeds. Weeks in India are of 6 working days, from Monday to Saturday. Children also follow this itinerary in their school calendar. On Sundays, they are missed. Last week was one of the most intense weeks so far. Children are the protagonists of this story, this project and this country. After carefully planning an excursion to a nearby location, we decided to pick Sarnath, 10km from Varanasi and the cradle of the first Buddhist community. More punctual than a watch, all the children were waiting at Seed for Change’s premises at 8 am on the dot, eager to learn something new. 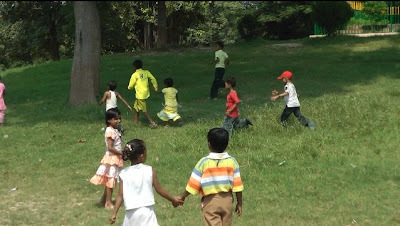 It is a challenge to take a group of 22 children out in the narrow alleys and keep them lined up. The journey was as beautiful as it was chaotic; there was a contrast of children’s naughty behaviour and the tiring honks of bikes. They moved forward linked like a chain, grabbing one another by the shoulders and looking up, watching all that was happening. After an unforgettable journey in a van, we reached our destination. I do not believe that I even felt such intense and enthusiastic feelings during my own school outings when I was a little girl. I do not remember feeling such eagerness and such restlessness to make the most of a trip, the determination to observe every detail and to use up as much energy as possible. The children had never had such fun, running along a wide green plain and playing in a funfair that most of them had never seen before. We took them to the archaeological museum, where they were amazed by the big Buddha statue and the historical paintings that rest on the museum walls. They were excited at the zoo, as they discovered new animals and unknowingly demonstrated progress in English as they were able to make themselves understood through the use of this language. At the end we were all exhausted. On the way back, all of them gradually fell asleep. It was such a satisfaction to see them close their eyes in such an innocent way, their slanting heads and their T-shirts powered with dust from the slide they had played on. The following day they came with renewed energy. Whilst having a coffee with Maria, Sameer amazed us as he made his way to his private tutoring. On the bar’s wall, there was a painting of Buddha. Exhilarated, he pointed at the painting, then looked at us and exclaimed: “Mam, Sarnath!!”. His use of this courtesy reference (Mam is a short word for Madam, a mark of respect) and his recognition left us speechless. We will definitely use this reference ourselves. We keep on discovering more of Varanasi. The waters of the Ganges are slowly descending, gradually allowing people to walk along the steps that flow into its banks. The mud persists, but like thick honey, it slowly dilutes. I would like to take this opportunity to remind you of an important date. Tomorrow, 17th of October is the International Day for the Eradication of Poverty. It is not necessary to remind you of the existence of poverty in the world, but the need to act to stop it is. 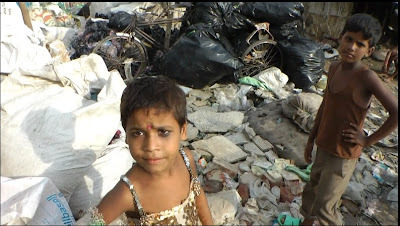 At Seed for Change, we are committed to a decent future for the most unprivileged children in Varanasi. In order to free them from this circle of misery and in most cases, of child exploitation, we offer them the best education possible so that they can opt for a future with more opportunities. We are all responsible. We can all change a life. When will I get my schoolbag?